Priority queues (PQs) are abstract data types that work just like regular stacks, but the popping order depends on each element’s priority instead of the sequence they were pushed onto the queue (FIFO or LIFO). The naïve way of implementing a PQ consists of using an unsorted list or array and searching for the highest-priority element at each pop, which takes O(n) time. There are several more efficient implementations, of which the most usual is the heap. Heaps are complete (i.e. 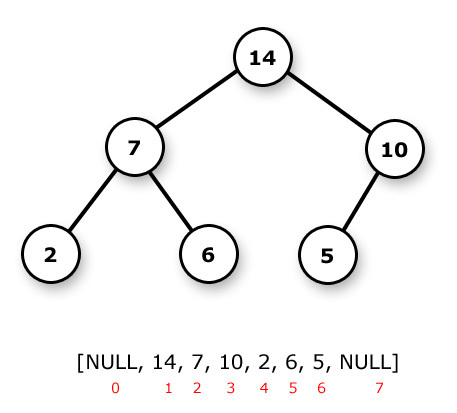 all levels except possibly the last are filled) binary trees that work as PQs by maintaining the following property: children nodes always have a smaller priority than their parent, i.e. for any node A with children B and C, priority(B) < priority(A) && priority(C) < priority(A). Note that there is no assumed relation between siblings or cousins. Each element of a heap has two pieces of information: a key and a value, hence we call them key-value (KV) pair. The key identifies the specific element, and the value determines the element’s priority within the heap. Heaps can be min-heaps (low value = high priority) or max-heaps (high value = high priority).